All external tuning is really from Metall. On photos my car on winter tyres. Sorry, but i havn't photos with summer tyres. I want to buy Audi 200 in Europe with 3B becauses i really HATE mechanical injector and i want change motor in my car to 3B. When i can buy it cheap? How it will be cost? 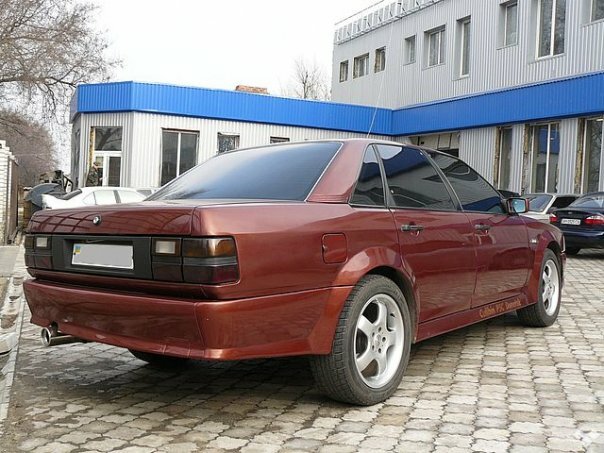 I saw audi 200 fo selling, but price is not good (over 2000 Euro i think it is really expansive for car 1990 y)! Hello and a warm welcome to ukraina first ! Your car looks really special, it's not usual to rebuild the whole carbody that way - but in my opinion it looks really nice! In germany you can forget such an 'upgrading' because there are no matching numbers to legalize it by the TÜV . The Audi 100/200 typ44 (C3) just become youngtimers, the prices in germany are on the way up!!! 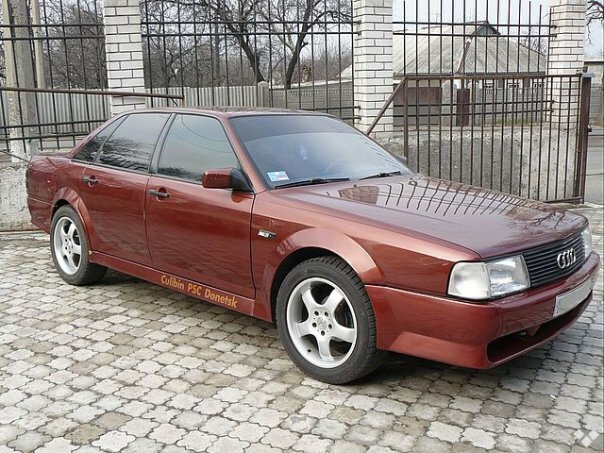 To find an 220V-Audi under 2000,-€ is not realistic yet, otherwise - good luck! 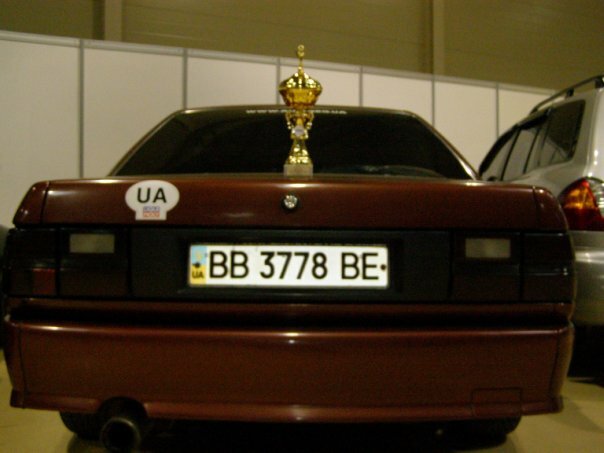 I'm not sure, if you can get an 3B-engine in good working condition for under 2000,-€, try it! We all are interested in the data of your car, is it a quattro? What engine? Specialties? Kilometers? Just tell us something! Is the interior also completely rebuilded? More photos please ! First. My car is from 1983 year. It is not quattro(((((( Now, engine is NG (from Audi 90). Before it i use WC. Now, i don't want mechanical injection. Maybe, it will be quattro, when i find Audi 200. This car was rebuild in 2005. When the body was ready, i started build sound system to EMMA. I finished it in 2009 and won EMMA in Russia in pure-passive master class. In doors i make a closed boxes from wood ( 10.5 liters) and install in it Dynaudio MW 160. In Handschuhfach i made a closed for subwoofer (20 liters) and install in it Helix P10. Photos i add to this forum maybe tomorrow. Now in my car audio components are not installed because i must sell it(( But now, i want to make a new projext. No pure-passive. I want a most loud and quality sound car in my country. What i can do with K-Jetronic? How i can change it on electronical enjection? And how much cost Audi S4 in good condition of the engine? Can i buy it for a 1500-2500 Euro? For rondabout 2k5€ i don´t think you will find an good s4. Or you look out for a car with an accident. Oh, it's possible to get S4s for that kind of money. This one, for example will cost about 2100 Euros - and you can part it and sell off what you don't need after converting your engine. I'd buy a complete donor car and not just an engine in any case. Alternatively, you can convert your engine to use electronic injection. There's several systems on the market for the 5-cylinder engine family. I'd say the most popular is the 034EFI: http://www.034motorsport.com/034efi-engine-management-c-22.html. This will cost you about US$ 1000-1200 for a fuel-only conversion (the ignition stays stock). Power only goes up marginally with this, though. ll external tuning is really from Metall. On photos my car on winter tyres. Sorry, but i havn't photos with summer tyres. Hi Ukraine! You car looks great! I also had an Audi 100, I use it in my everyday driving. By the way, if your looking for parts and accessories for your Audi 100, feel free to check it from jcwhitney. I got there most of my parts and accessories for my my 1994 Audi 100.